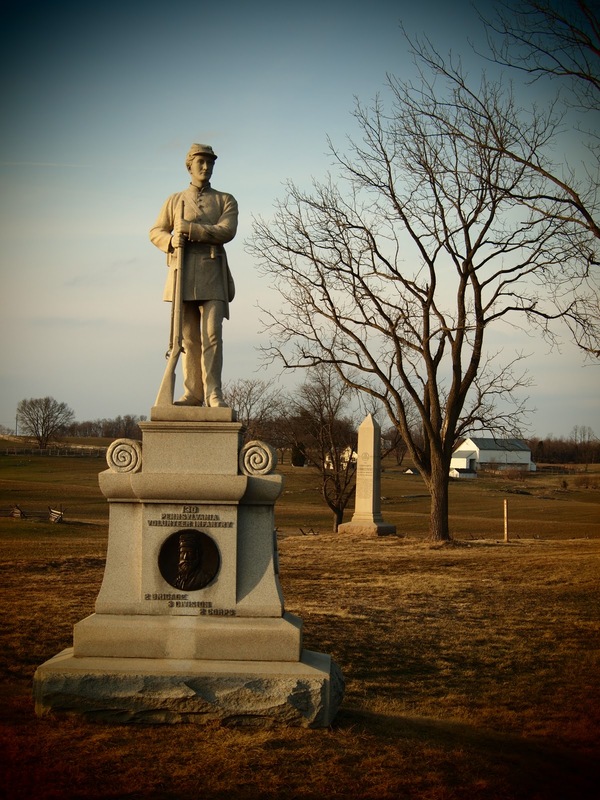 the following post first appeared on the blog of Antietam Battlefield Guide candidate Dave Maher (Pennsylvania’s Emergency Men) on Nov. 29, 2011. Dave’s blog is an on going study of the men, moments, and stories of the Pennsylvania Emergency Militia of September 1862, and July 1863…with the occasional “detour” posts, ranging from archive finds to historic preservation; from local heritage to National Parks. Having lived and studied in the small Cumberland Valley town of Shippensburg, I have always been drawn to the stories of the 130th Pennsylvania Infantry. Nearly six full companies of the Regiment hailed from farms and communities within Cumberland County, including Company D, which was raised right in the heart of Shippensburg. Much of the remainder of the 130th was organized in neighboring York County. 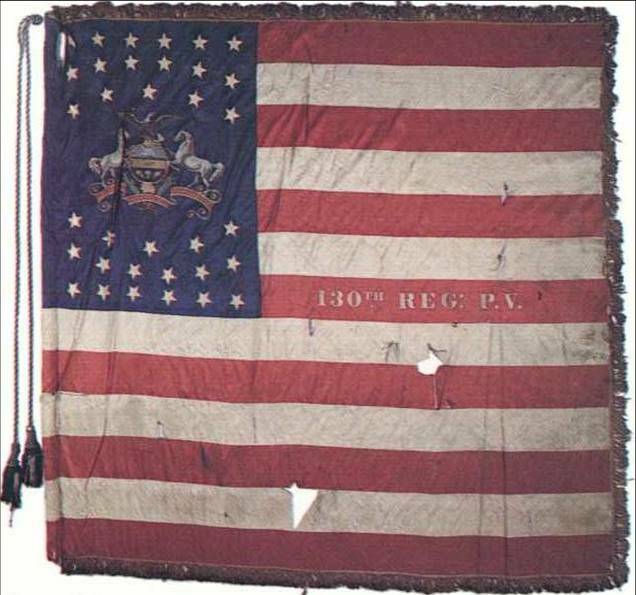 Raised in the late summer of 1862, the 130th was one of fifteen Pennsylvania regiments (122nd to 137th Regiments) organized to serve an enlistment period of nine months. Even though many earlier Cumberland County men had enlisted for three years with the famed Pennsylvania Reserve Corps, and had already seen many grand battles, the men of the 130th would not be left out. Those short nine months would take the 130th through some of the War’s most terrible battles. Antietam, where they doggedly battled the Rebels in the Sunken Road. Fredericksburg, where they took part in the bloody and hopeless assaults on the enemy position at Marye’s Heights. Chancellorsville, where they helped solidify the Union flank after a surprise attack by Stonewall Jackson sent thousands of Union troops fleeing in fear and confusion. The story of the 130th fits in well with the story of Pennsylvania’s Emergency Men. A month before Lee’s movement northward, into Maryland, which triggered the “Emergency” in Pennsylvania, the 130th marched off to war. With Harrisburg a perceived target, and the Cumberland Valley a natural highway for the Rebel troops, one can imagine that the minds of the men in the 130th traveled back to the homes they left behind. The organizing of the Emergency Militia in defense of the Commonwealth may have helped put the 130th’s mind at ease, but as they took part in the pursuit of the Rebel army through Maryland and into the southern portion of the Cumberland Valley, one would expect that their determination was at its height. As chance would have it, the 130th’s first battle was Antietam, the bloodiest single day in American history. The men of the Regiment were no doubt unsure of what awaited them that September day, but by the end of battle, the 130th had held strong, and proved themselves veterans. Forty six members of the Regiment were killed, 132 were wounded. They did their part in ensuring the safety of their homes and loved not far to the north. Nine months later in June 1863, after the 130th returned home, Robert E. Lee and the Rebel army once again threatened the peaceful Cumberland Valley by pushing north. 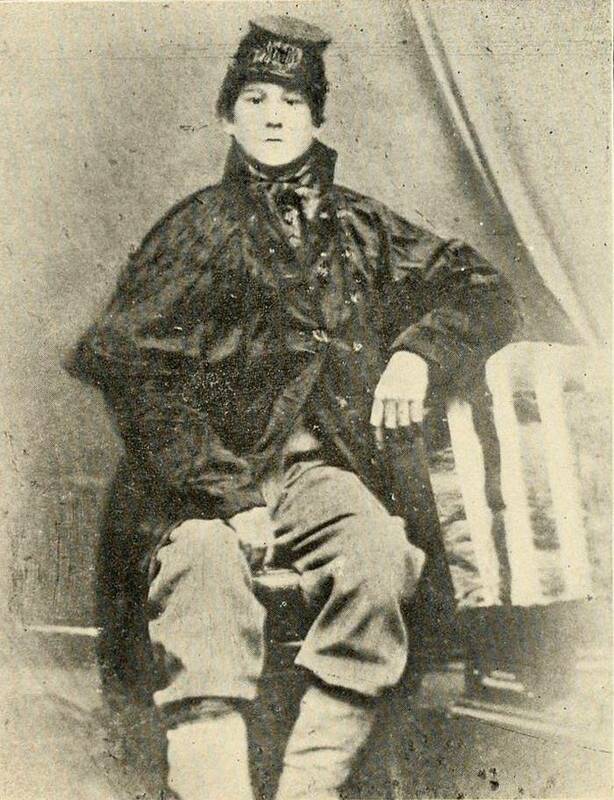 In fact, when part of Confederate General Robert Rodes’ Division occupied Shippensburg, they pillaged the home of the Captain of Co. D, James Kelso, once word spread that a former Union officer lived there. Pennsylvania Governor Andrew Curtin once more called for the creation of a force of “Emergency Militia”. Scores of men who had recently returned home from service in a “nine month regiment” answered the call. Since these men had military/combat experience, many were given higher rank and authority in the newly formed militia units, as they marched off to fight for their homes. As a student of the Maryland Campaign, and an adopted son of the Keystone State, something has always interested me about the stories of Pennsylvania’s nine month regiments. While six of these regiments saw fighting during the Battle of Antietam, the 130th has always had a special place in my thoughts. Perhaps it is the fact that I lived among the same towns, roads, and farms they once knew. Or, maybe it is the fascinating loss of innocence that raw, ‘green’ troops experience the moment they fire their rifles at an enemy, or the first time they witness a comrade struck down in battle. Either way, to best understand these men, it is best to hear their stories, thoughts, and memories in their own words. Below are a few such voices. Speaking to an audience in 1894, at the Capt. Colwell G.A.R. (Grand Army of the Republic) post in Carlisle, 1st Lt. John Hays, formerly of the 130th Pennsylvania, Co. A, documents the Regiment’s journey towards their “baptism of fire” at Antietam; a mere month since they enlisted. During the devastating Union defeat at the 2nd Battle of Bull Run, the 130th was marched back to Washington where it became part of the “reserve army corps of the Potomac.“ “The terrific cannonading sounded to us like the continuous detonations of distant thunder. We were anxious to know the result of the battle, and had not long to wait, for, on the second day after, along came the retreating Army of the Potomac [and the Army of Virginia], dust-laden, ragged and weary,” wrote Spangler. Continuing their arduous march on September 13th, through stifling heat and choking dust, Spangler and the rest of the 130th, “…crossed a commanding range of hills… We beheld the church-spired city of Frederick and the broad, fertile and opulent valley of the Monocacy, shut in by low mountains of surpassing grace and outline, with all nature abloom, – a scene in the fierce sunlight of enchanting beauty.” Once in the city, Spangler experienced a heart warming welcome from throngs of happy citizens. 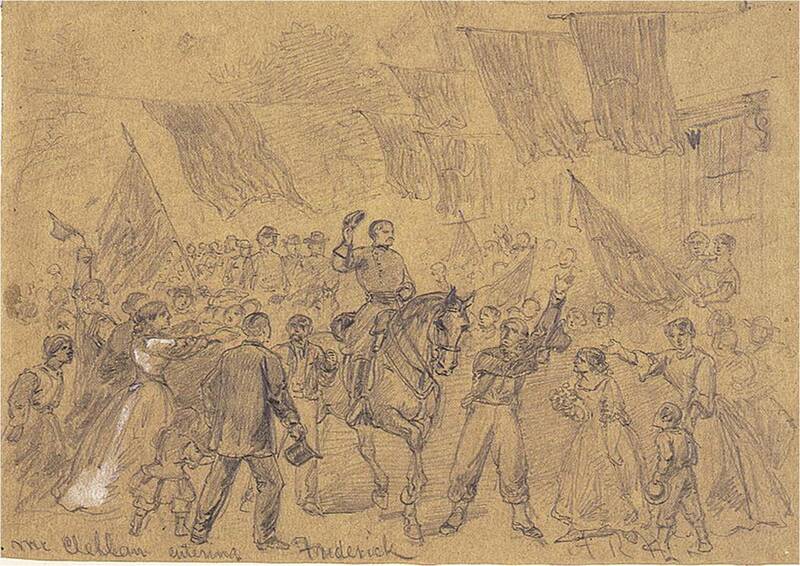 Upon entering the city, “…with full brigades with all the pomp of war and past the Army Commander [McClellan] and glittering staff, the streets resounding with applause, amounted to an ovation. The stars and stripes…were now unfurled and floated to the breeze. Ladies, dressed in their best, waved their handkerchiefs and flags. The populace cheered to the echo, tokens of a most cordial welcome, and supplied water and refreshments to the thirsty and hungry men. Their smiles and tears of gratitude and joy, attested their loyalty to the Union in no uncertain degree.” Such a reception was a rare occurrence, especially for Union army veterans who were more accustom to the shuttered windows, jeers, and cold shoulders received while marching through towns in the South. The patriotic display did much to raise the hearts of soldiers, whether veteran or untested, as in the case of the 130th. 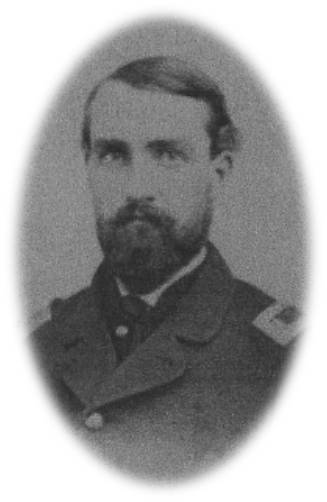 The next morning, John Hays and the 130th made a “…weary march…over the mountain, through Boonesboro and Keedysville, across the [Little] Antietam [Creek], until at night a halt was made in the rear of the hill that overlooked the ground to be made historic by the efforts of the contending heroes. There, during Monday night, all of Tuesday and Tuesday night, lay the Regiment with its, and other commands, old and new, and learned on [Wednesday] the never to be forgotten whiz and ringing bang of bursting shells. Wednesday morning brought the terrible Battle of Antietam; the 130th Pennsylvania would be “green” no longer. Armstrong Jr., Marion V. Unfurl Those Colors! : McClellan, Sumner, and the Second Army Corps in the Antietam Campaign. Tuscaloosa: University of Alabama Press, 2008. Carman, Ezra. The Maryland Campaign of September 1862. Vol. 1, South Mountain. ed. Thomas G. Clemens. New York: Savas Beatie, 2010. Daihl, Elijah McGee. letter to brother Rueben. accessed 27 November 2011. available from: http://webspace.ship.edu/jqbao/ShipMuseum/page26/page29/page59/page59.html#2; Internet. Hays, John. The 130 Regiment, Pennsylvania Volunteers in the Maryland Campaign and the Battle of Antietam. An address delivered June 7, 1894, before Capt. Colwell Post 201 G. A. R. Carlisle, PA: Herald Printing Co., 1894. Spangler, Edward W. My Little War Experience. York, PA: York Daily Publishing Co., 1904. Thanks for sharing this great post here Dave. Terrific material here about the 130th Pennsylvania.